What is the next step after medical therapy and selective laser trabeculoplasty? A 60-year-old Native American woman presents for consultation after selective laser trabeculoplasty (SLT). The patient has a long history of ocular inflammation and secondary glaucoma. Inflammation has been controlled on systemic adalimumab. Occasional flare-ups have been treated with topical steroids, but this therapy has not been needed for years. The patient’s IOP had been controlled in the midteens on latanoprost and timolol, but it was found to have increased to 35 mm Hg OD at a recent visit. In her left eye, IOP was 15 mm Hg. Therapy with netarsudil ophthalmic solution 0.02% (Rhopressa, Aerie Pharmaceuticals) was initiated in the patient’s right eye, and IOP subsequently decreased to 29 mm Hg. The patient underwent SLT in her right eye, and now, 2 months later, IOP is 24 mm Hg OD on latanoprost, timolol, and netarsudil. On examination, the angles are open in the right eye, with no peripheral anterior synechiae visible on gonioscopy. The crystalline lens is clear. Advanced imaging with OCT shows early thinning of the nerve fiber layer in the right eye and no changes in the left eye. The patient has cup-to-disc ratios of 0.65 OD and 0.40 OS, and the Humphrey visual field (Carl Zeiss Meditec) in each eye is full. BCVA is 20/20 OU, and the patient is emmetropic for distance. The target IOP for the right eye is midteens. She is allergic to sulfa medications and brimonidine. Cases like this one make us physicians. They are not straightforward, and they require a significant amount of thought. On the surface, the situation appears to be simple: IOP is uncontrolled on maximum therapy, and surgery is indicated. In actuality, however, there are a number of confounding factors. The patient’s uveitis has been well controlled for years, so we need to be cautious in our efforts in order not to bring the patient out of remission. Additionally, preserving excellent visual acuity in a phakic patient merits some attention; intraocular surgery can imperil lens clarity and induce cataract formation. Conventional training of yesteryear would tell us to implant a glaucoma drainage device such as an Ahmed Glaucoma Valve (AGV, New World Medical), but, with options for microinvasive glaucoma surgery now available, placement of a glaucoma drainage device seems a bit aggressive in this case. The modest response after SLT and enhanced pressure reduction with netarsudil use suggest abnormal resistance to outflow at the proximal and distal ends of the conventional outflow system. I would therefore perform a microinvasive glaucoma surgery procedure that targets both parts of the system to maximize outflow. My preference in this case would be to combine circumferential viscodilation of Schlemm canal and the distal collector system via an ab interno approach with a focal goniotomy. I would pretreat the patient with a topical steroid to reduce the risk and extent of postoperative inflammation, and I would limit goniotomy to a few clock hours so that the canal ostea will be visible and amenable to intubation if future angle surgery is needed. No. 3: combined glaucoma from Nos. 1 and 2 or exacerbation of existing glaucoma. It is unusual that this patient has a clear crystalline lens, considering her age and long-term history of uveitis severe and/or chronic enough to require oral biologic antibody treatment. After confirming that a proper workup for uveitis was completed, we would perform an ophthalmologic examination to rule out other complications of uveitis such as cystoid macular edema. Because this patient has no visual field loss and the decrease in her nerve fiber layer thickness is at an early stage, there are several options for treating her elevated IOP. A first option would be to make sure inflammation is under control because enhanced medical uveitis control can improve IOP control.1 A second option would be to initiate therapy with a topical carbonic anhydrase inhibitor because cross-reactivity with sulfonamide antibiotics is unlikely2; this form of treatment, however, is unlikely to reduce IOP to a reasonable level. Goniotomy would be a reasonable third option. It involves an ab interno incision of the trabecular meshwork using a goniotomy knife. 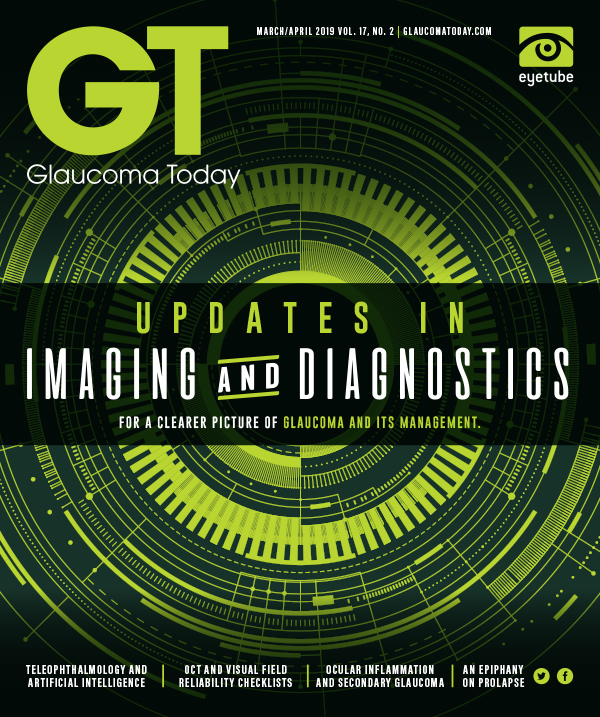 When combined with cataract surgery, goniotomy achieves approximately a 33% reduction in IOP at 6 months according to retrospective data on patients with open-angle glaucoma.3 Outcomes in adult uveitic glaucoma, however, are less clear. Our decision on the type of surgical intervention would involve a detailed discussion with the patient about her willingness to continue using daily ocular hypotensive medications. If she confirmed this willingness, we would suggest goniotomy as the next step. Regardless of central corneal thickness or hysteresis measurements, the IOP in the right eye is higher than the goal, given the difference in cup-to-disc ratio of more than 0.20. This phakic patient has preperimetric secondary open-angle glaucoma in her right eye despite essentially maximum tolerated topical therapy. • Age and life expectancy. I would assume this patient has more than 20 years of life left. • IOP target. Considering the cup-to-disc ratios and preperimetric disease, a target in the high teens would be reasonable. • Medication burden. The patient currently tolerates three classes of medication, and, for the purposes of this article, I will assume that she adheres to the prescribed therapy. It is therefore unnecessary to attempt a procedure that has a high chance of eliminating the need for medication, which is an advantage because such procedures sometimes carry greater risk. • Anticoagulation. If the patient is on blood thinners (especially platelet inhibitors or warfarin) that she cannot stop, I would hesitate to recommend laser therapy that would ablate a large area of the angle. I will assume she is not on blood thinners. • Risk tolerance. Would this patient be willing to pursue higher-risk treatment if its effect might last longer or be more “definitive”? I put the word in quotation marks because, regardless of the type, glaucoma surgeries generally fail over time. • Ability to follow up. A round trip of 400 miles would make an option like trabeculectomy (with nearly 70% intervention rates according to the Tube Versus Trabeculectomy [TVT] study6) less appealing. • Lens status. The crystalline lenses are reportedly clear, so I will assume she has no visual symptoms from cataracts. I would therefore not consider a procedure that relied on cataract extraction to decrease IOP. • Type and severity of glaucoma. In my experience, mild secondary open-angle glaucoma typically responds well to trabecular meshwork–based procedures. After considering all of the aforementioned factors, I would offer this patient two choices. The first would be a large trabecular meshwork incisional procedure such as gonioscopy-assisted transluminal trabeculotomy. The second would be a primary tube shunt procedure because her IOP is greater than 22 mm Hg. In this case, I would be comfortable with either a valved or nonvalved tube (the AGV is a flow restrictor rather than a true valve). If I were concerned about ciliary body shutdown because of frequent flare-ups of inflammation, I would choose the AGV. My preference would be to start with a surgical procedure that relies more on physiologic aqueous outflow, rather than one that creates an external drain. With gonioscopy-assisted transluminal trabeculotomy, I would consider a postoperative IOP in the midteens off medication to be a great success. In general, I counsel patients that they will likely achieve an IOP in the midteens on one or two classes of medication. Before surgery, I would pretreat this patient with steroids for a few days. Intraoperatively, I would pressurize the anterior chamber to about 20 to 25 mm Hg at the end of the case after a thorough washout of the hyphema. If there were a large amount of blood reflux, I would instill a dispersive OVD in the anterior chamber because early hypotony can lead to a dramatic reflux of blood and, in rare cases, a total hyphema. Sealing or suturing corneal incisions in these cases can be beneficial. I would instruct the patient to stop using antiglaucoma medications on the day of surgery and titrate drops to achieve the desired IOP after the steroids had been washed out. I treat IOP spikes early in the postoperative course (with pilocarpine if there is no significant inflammation). In patients who have a history of uveitis, rather than automatic tapering, I taper steroids based on the decrease in white blood cells. I am not a surgeon who treats a microhyphema with steroids. This relatively young patient with inflammatory glaucoma had no active inflammation and no peripheral anterior synechiae in the drainage angle. I approach patients with these characteristics in the same way I would a patient with primary open-angle glaucoma who was in the same situation. SLT had worked to some degree, so I knew the canal had not failed completely. I used the Omni Surgical System (Sight Sciences), which combines 360º ab interno canaloplasty/viscodilation and 360º ab interno goniotomy. The postoperative course was uncomplicated. One day after surgery, IOP was 9 mm Hg. Transient red blood cells were visible in the anterior chamber but had resolved by week 1. Her target IOP of 16 mm Hg had been reached off medication 3 months after surgery. 1. Neri P, Azuara-Blanco A, Forrester JV. Incidence of glaucoma in patients with uveitis. J Glaucoma. 2004;13(6):461-465. 2. Brackett CC. Sulfonamide allergy and cross-reactivity. Curr Allergy Asthma Rep. 2007;7(1):41-48. 3. Berdahl JP, Gallardo MJ, ElMallah MK, et al. Six-month outcomes of goniotomy performed with the Kahook Dual Blade as a stand-alone glaucoma procedure. Adv Ther. 2018;35(11):2093-2102. 4. Christakis PG, Zhang D, Budenz DL, et al; ABC-AVB Study Groups. Five-year pooled data analysis of the Ahmed Baerveldt Comparison Study and the Ahmed Versus Baerveldt Study. Am J Ophthalmol. 2017;176:118-126. 5. Bettis DI, Morshedi RG, Chaya C, et al. Trabeculectomy with mitomycin C or Ahmed valve implantation in eyes with uveitic glaucoma. J Glaucoma. 2015;24(8):591-599. 6. Gedde SJ, Herndon LW, Brandt JD, et al; Tube Versus Trabeculectomy Study Group. Postoperative complications in the Tube Versus Trabeculectomy (TVT) study during five years of follow-up. Am J Ophthalmol. 2012;153(5):804-814.e1.